An artist rendering of the proposed 16-story building on Sherman Avenue. Albion Residential’s proposal passed 4-2 in the Plan Commission on Wednesday. The Evanston Plan Commission recommended Wednesday that City Council approve a proposal from Albion Residential for a new apartment tower on Sherman Avenue. The vote passed 4-2, but the commission’s recommendation of the 286-unit complex was contingent on an increased number of affordable units, a 16-foot height reduction and 14 additional parking spaces. The decision followed two hours of public testimony in which many Evanston residents voiced concerns regarding the size of the building, lack of affordable housing units, zoning violations, neighborhood livability and congestion. Most community leaders were especially worried about rising rents in Evanston and high costs of living, arguing that Albion’s original proposal of creating two affordable housing units and giving a required payment of $2.9 million to the city’s affordable housing fund was insufficient to address the shortage of affordable homes. While Albion’s revised proposal fell short of the maximum number of possible affordable units, the developer proposed a 13-unit increase — bringing the total from two to 15 — that represented a nod to public concern. But this change hasn’t appeased the significant opposition to the project as a whole. Though several residents supported the development, saying during public testimony that it would provide a much-needed economic boost to the area, others said the building was an example of damaging overdevelopment. A Change.org petition, calling for an end to the “Mega-Development on Sherman,” had acquired 1,345 signatures as of Thursday evening. Barbara White, who lives on nearby Oak Avenue, said the new building would fundamentally change the “character” of her neighborhood. 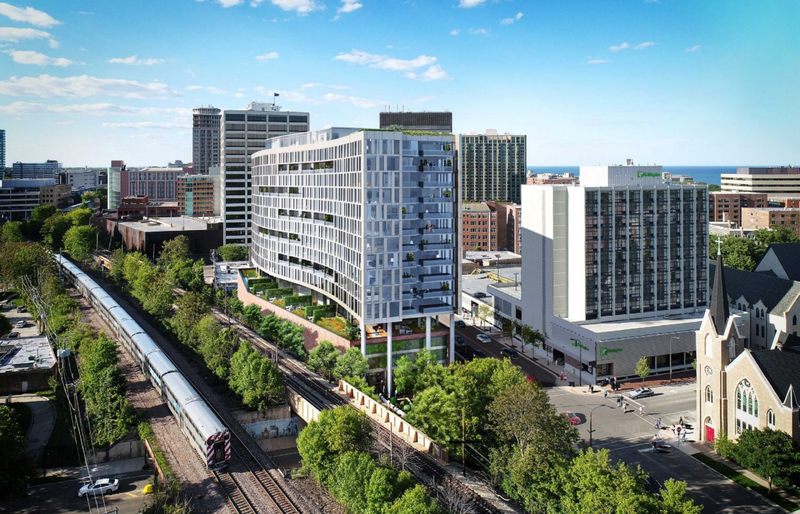 Seth Weinberger, a former chairman of the Evanston Zoning Board of Appeals, called the project an “obliteration of the zoning code” in a recent letter to the Plan Commission. “They’re doubling what’s allowed, and that shouldn’t happen,” he said. Albion spokesperson James Prescott disagreed, saying that with allowances for parking they could build a building even taller than the one they are currently proposing. Prescott said many people had a “fundamental misunderstanding” of the zoning process. City Council’s Planning and Development Committee will address Albion’s plan at its next meeting on Oct. 9. Sign up to receive our bi-weekly digest in your inbox. Who has been your favorite A&O guest this year?